The Honeygrow and Black Seed collaborative dish. Here's a mashup you didn't know you needed: Honeygrow and Black Seed Bagels. The fast-casual stir-fry phenomenon collaborated with the New York City spot, which rolls its bagels by hand (yum), to create a dish that channels a breakfast classic. RELATED: Here's a look inside Sprouts Farmers Market at Lincoln Square | South Philly Barbacoa will be featured on Netflix's "Chef's Table"
The new dish, which will only be available at a few Honeygrow locations, was inspired by the deliciousness that is a lox sandwich on an everything bagel – it's one of Black Seed's most popular menu items. The collaborative dish is made with Honeygrow's freshly-made egg white noodles, smoked salmon and organic baby spinach tossed in house-made three-herb pesto (parsley, basil and dill). It's topped with Black Seed everything bagel croutons, Black Seed everything bagel spice, red onion, fried capers, watermelon radish, fresh dill and tobiko. 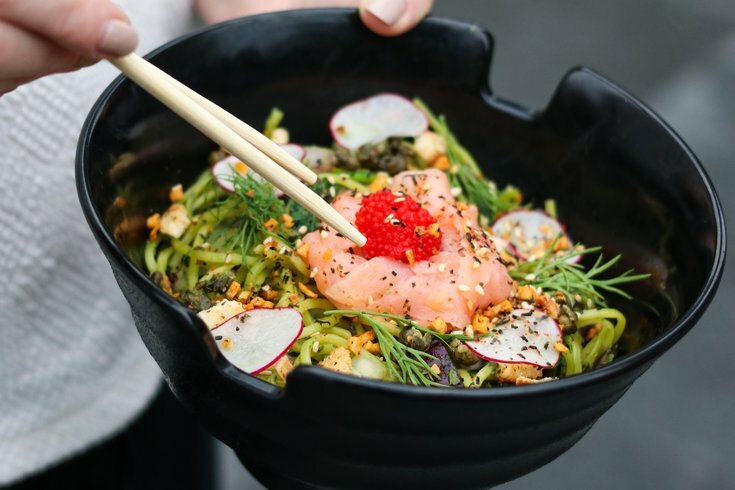 In Philadelphia, the creative noodle dish will be exclusively available at Honeygrow’s new test kitchen in Fishtown (1601 N. Front St.) starting on Monday, Oct. 1. At the test kitchen, the Honeygrow + Black Seed collaboration will be one of five featured dishes. Customers can place orders via the Honeygrow + Minigrow app to grab at the pickup window on Front Street, or can get items delivered through Caviar.